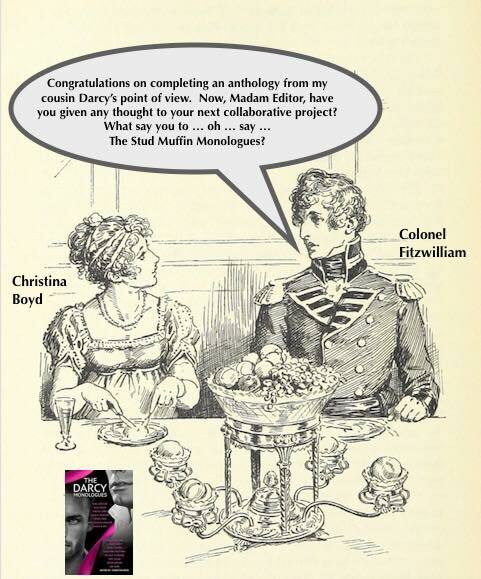 Babblings of a Bookworm : An Announcement from Christina Boyd - New Anthology Coming Soon! Thank you, Ceri! Am so looking forward to getting your hands on this collection. It's really shaping up to even more than I had imagined. Can't wait! I'm really looking forward to reading this one, Christina, so I was happy to join in the announcement excitement! I think it's going to be a fantastic project! Oh. My. Goodness! What fantastic news to find in my inbox this morning. This sounds so amazing, Christina. Just the list of authors and the above snippets have me drooling over my iPad! It's definitely going on my Want to Read list at Goodreads as soon as I've finished here. Can't wait for November, and I'm now trying to think of a tour I can take these gentlemen on as I did with The Darcy Monolgues last week! You heard it here first, folks. Anji wants to go on tour with a bunch of bad boys! And why not, Joanne? Especially when they're written by a bunch of writers like you guys! 11 bad boys with Anji! YES!! Thanks for helping share the news, Ceri :) This is going to be a fun collection! Thanks for hosting Christina's announcement, Ceri! So glad the Austen bad boys are having their stories told. It's wonderful to be part of your Dream Team again, Christina, and can't wait to read the whole collection! That's such a great plan, Anji! Yes, a tour with the gentlemen rogues, that should be fun ;) Hope we can meet on that one!! Take care and good luck with the planning. That'd be fantastic Joana. Then I could ambush you to sign BOTH books for me! Such a shame that geography got in the way of us meeting this time. Thank you for spreading the news about Christina Boyd’s new anthology Dangerous to Know: Jane Austen’s Rakes and Gentlemen Rogues … or, Bad Boys Babbling Backstories. The gentleman had grounds for complaint after his wife had a harrowing time with a RAKE at a garden party. Groan, so bad :) Thank you so much for dropping by, Joanne! For those of you who may not know, J. Marie Croft's wittily captioned pictures sparked the idea for this anthology. The one in question is above. They were all so funny, but who would have thought that a funny picture would spark an anthology? You can add 'muse' to your CV! Joanne! You are a master wordsmith! What fun. We can't help but be drawn to the bad boys. A lot of people like bad boys, Becky. Funnily enough, they don't attract me. I like good boys instead, which isn't fun, but is far more sensible! I am more of an Elinor than a Marianne. I cantbwiatbtonhear how you like it! Thankfully I do not edit via iPhone and Siri. Haha! Absolutely, Carole. The back story of a bad boy is always interesting, what made them become what they are? Yay, can't wait to read it! I'm so excited! Me too!! I hope you will enjoy it as much as I am editing it! So looking forward to reading this. Good luck with publishing. I'm looking forward to it too, Sheila. I really enjoy anthologies, as they are easy to pick up and put down and I seem to be really busy this year, so I find it fits in with life well.